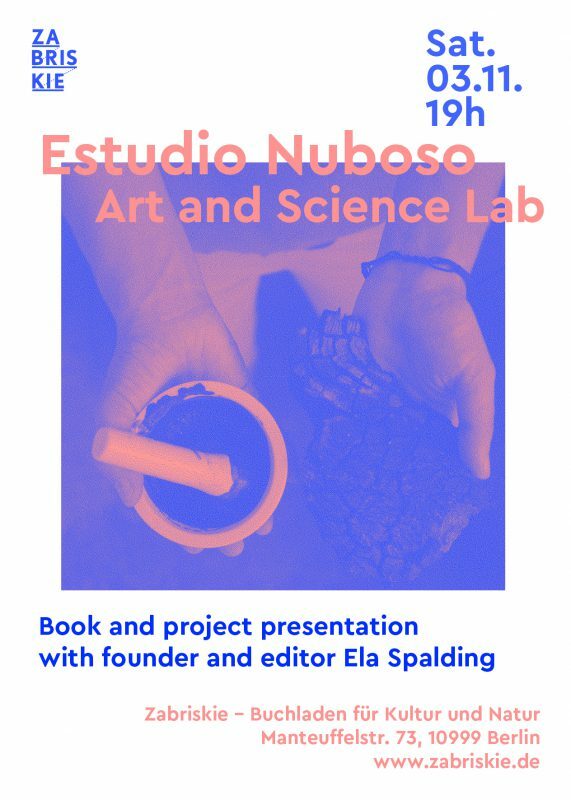 Estudio Nuboso’s LAB de Arte y Ciencia is a format for knowledge exchange that promotes collaboration between scientists and artists to produce a positive impact on society and the environment. Based in Panama, the project has been run twice – in 2015 and 2017 – with a residency period, followed by exhibitions, public programs and publications. As the LAB itself has evolved and other Berlin-based projects emerge, it is time to share experiences and have an open conversation with other people that are interested in the intersection of art, science and nature. Ela Spalding was born in Panama in 1982. She is an artist and cultural producer, focusing on the human-nature-culture relationship. Her art and facilitation work navigates exchanges between people, ecosystems and disciplines to provoke an active reflection on how we inhabit the world today . She is founder and creative director of Estudio Nuboso – a platform for art and ecology in Panama, founding member for Archipel e.V. a Berlin-based cross-cultural collective and community radio station, as well as Associate Curator in the Center for Contemporary Art and the Natural World. She shares her time between Panama and Berlin.